Restorations made during the early 17th century: both legs, the plinth, the support at the left leg, pieces in the lion’s skin. The arms were also restored but have been removed. This statue and the over-life-sized statue of Hercules across the courtyard in all probability were made as a pair to decorate one of the great spaces in a large public bath. 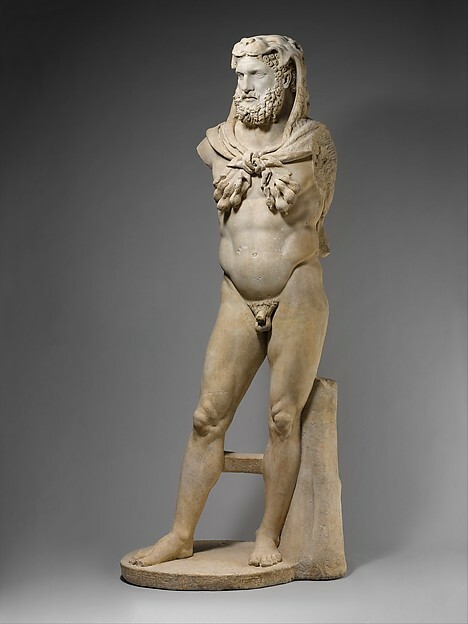 Although they are much restored, their stance and attributes are essentially correct and are variants on long-established statue types that probably originated in images of the Greek hero Herakles dating to the fourth century B.C. They were part of the large collection of ancient sculpture assembled in Rome at the beginning of the seventeenth century by a wealthy Genoese banker, the Marchese Vincenzo Giustiniani.